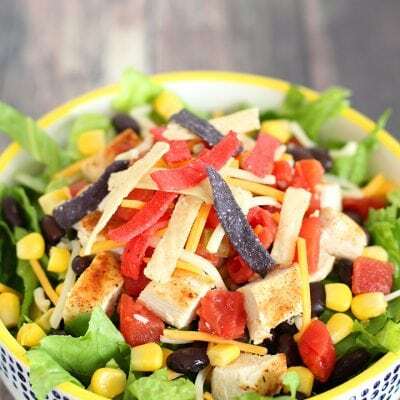 This delicious fiesta chicken taco salad is quick and easy to make using leftover grilled chicken, canned corn, black beans, and salsa tomatoes. When summer temperatures skyrocket into the triple digits, I find myself reluctant to turn on the oven, and the thought of making dinner can feel like an overwhelming task. Fortunately, we keep a well stocked can pantry (or “cantry,” if you will! ), so making dinner on those hot nights can be a breeze! 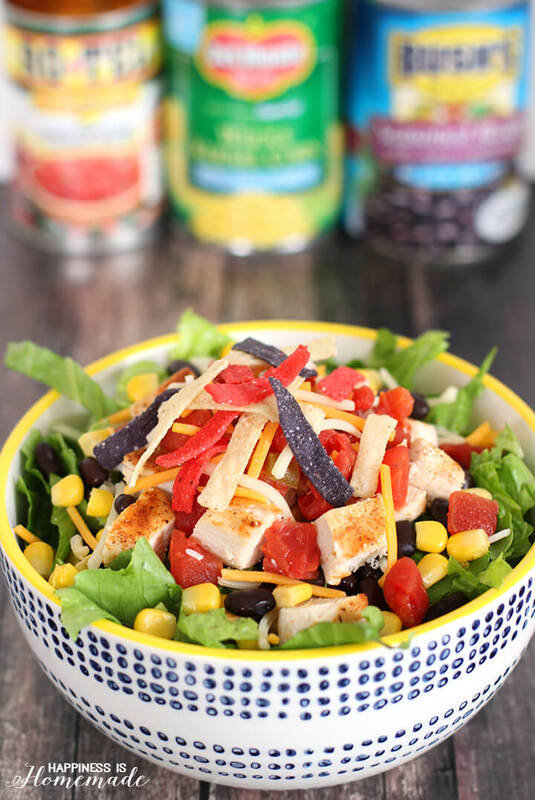 Last night I whipped up a refreshing fiesta chicken taco salad in just minutes using lettuce, leftover grilled chicken, a sprinkle of cheese and several cans from my cantry – salsa tomatoes, golden sweet corn and seasoned black beans. 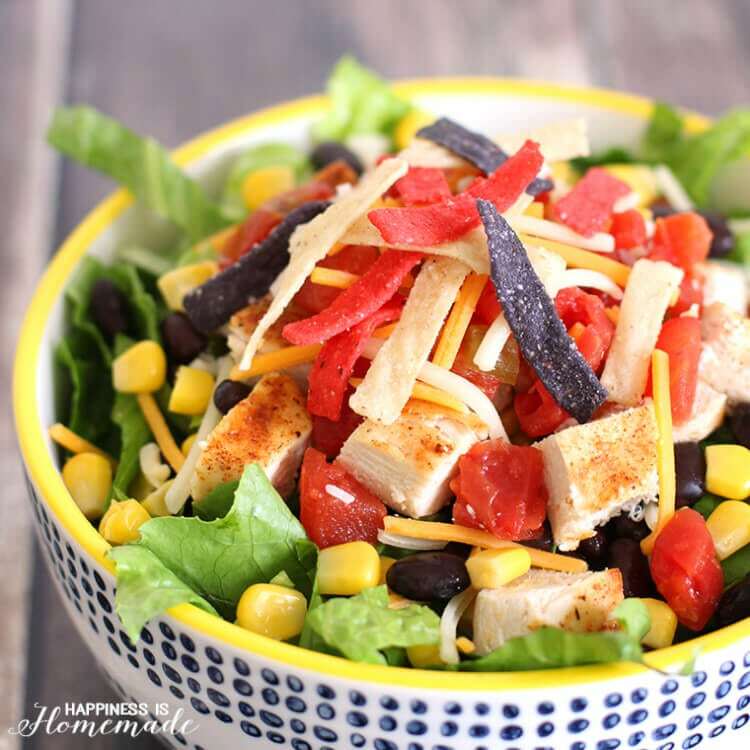 This salad is super easy peasy to make! Just open up the canned goods, drain the excess liquid, lightly rinse the black beans, chop up the leftover chicken, and shred the lettuce. 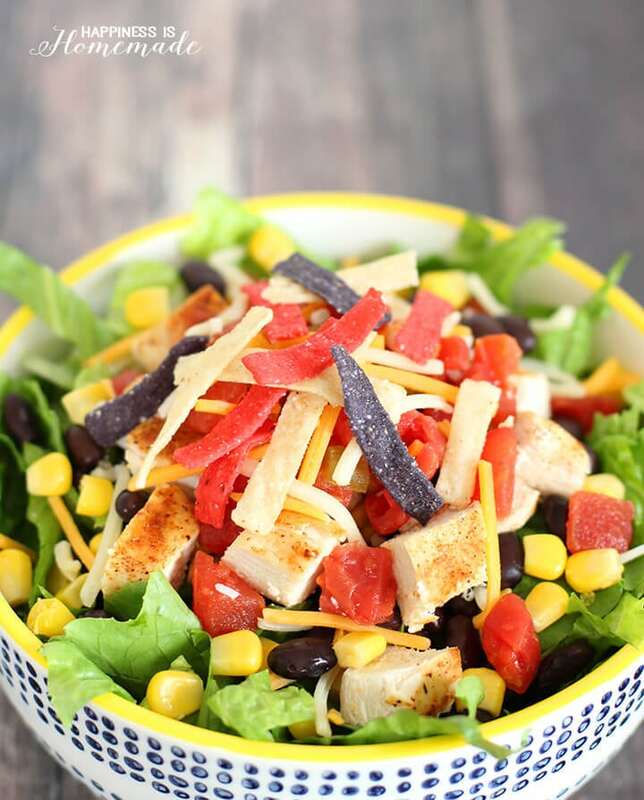 I fill the salad bowl with lettuce and then add a layer of corn, black beans and chicken on top. 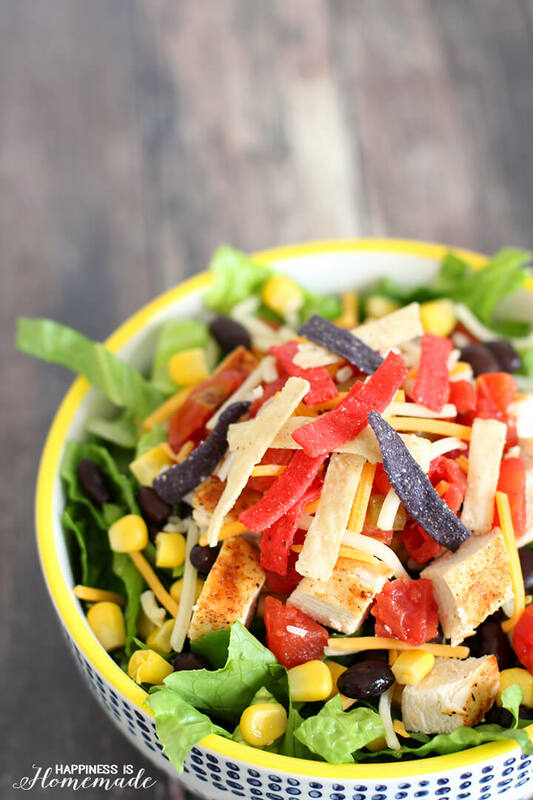 Top with a large spoonful of the salsa tomatoes, a sprinkle of shredded cheese, and a few tri-colored tortilla strips for crunch. I use the salsa tomatoes to add a punch of flavor in lieu of salad dressing, but a creamy avocado cilantro dressing would probably be fantastic for those of you who prefer to include salad dressing. Thanks to my well stocked cantry, I was able to put dinner on the table in around 10 minutes! 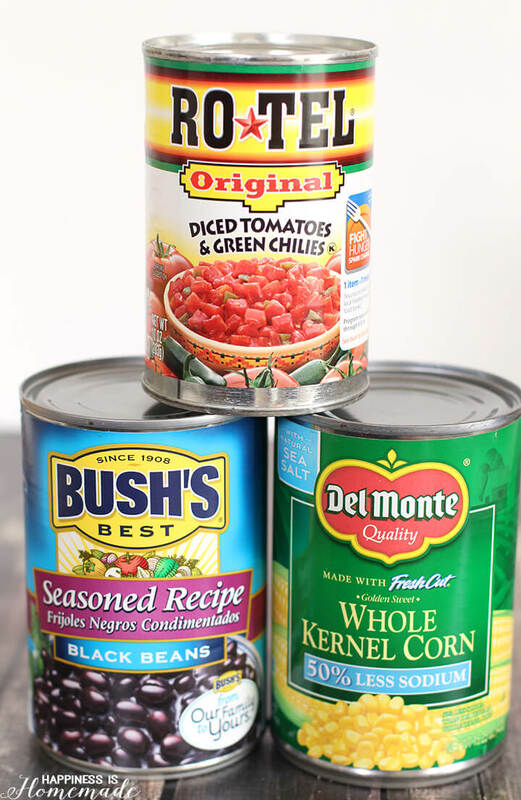 Using canned goods saves a TON of prep time, and it’s a great way to add additional vitamins and nutrients to your meals. People often have the misconception that canned goods aren’t as healthy as fresh foods, but the can is one of the best ways to get food from farm to table – locking in nutrients at the peak of ripeness just hours after picking. Not to mention that canned goods last much longer and cost about 15-20% less than fresh! 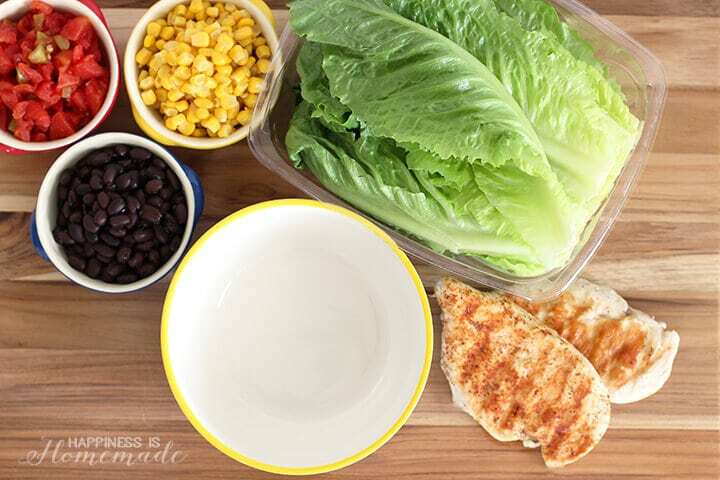 Tear or shred the lettuce into bite sized pieces, and place into a large serving bowl. Open, drain and rinse the canned goods. Chop the chicken breasts into bite sized pieces. 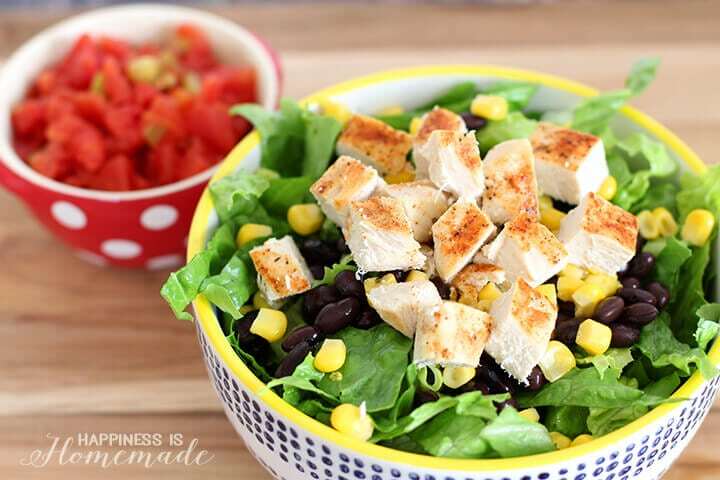 Top the lettuce with black beans, corn, and chicken. Add a scoop of Ro*Tel on top and garnish with shredded cheese and tri-colored tortilla strips. 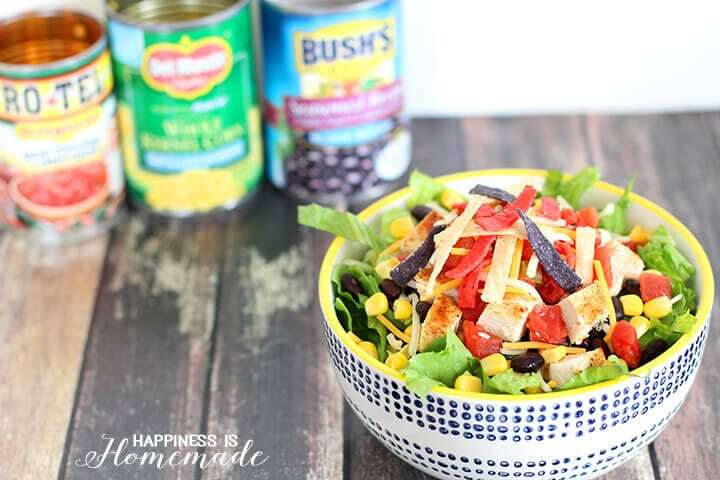 For more quick and easy recipes and information about the benefits of cooking with canned goods, check out the Cans Get You Cooking website, and stock up on your canned goods at Safeway and Albertsons! This is a sponsored conversation written by me on behalf of Albertsons & Safeway. The opinions and text are all mine.